Toyota revealed details of its research into its self-driving cars Monday, just ahead of the Consumer Electronics Show, in Las Vegas. The automaker also showed off a Lexus research vehicle which is equipped with devices that allow it to detect and automatically respond to its surroundings. The car can drive, on its own, through a fairly complex environment, without a person touching the steering wheel or pedals. Loaded with new technology, cars -- like this experimental Lexus -- could one day be able to drive themselves through traffic. Toyota said the vehicle is aimed at "the development of systems capable of enhancing the driver's perception of his or her environment, assisting in the decision-making process and improving overall driving skills." In other words, the purpose of the car is to research technologies that can help drivers avoid crashes and, perhaps someday, fully take over the act of piloting the car. The car is equipped with, among other things, a laser system that allows the car to see objects all around it up to a distance of about 230 feet, plus radar on the front and sides and high-definition color cameras that can see traffic lights and vehicles approaching from the sides. Toyota's research also involves vehicle-to-vehicle and vehicle-to-infrastructure communication, the automaker said in an announcement. Those technologies allow cars to wirelessly communicate with one another and with things like traffic lights and stop signs. For example, a car could signal vehicles around it when it stops or turns or when it encounters a slippery road surface. Similarly, a traffic light could wirelessly signal that it is turning red so approaching cars can automatically apply their brakes. As part of its research, Toyota said, the automaker has created an 8.6-acre proving ground in Toyota City, Japan. The proving ground is modeled after an urban driving environment with roads, intersections and traffic signals that replicate real-world traffic situations including multiple vehicles and pedestrians. 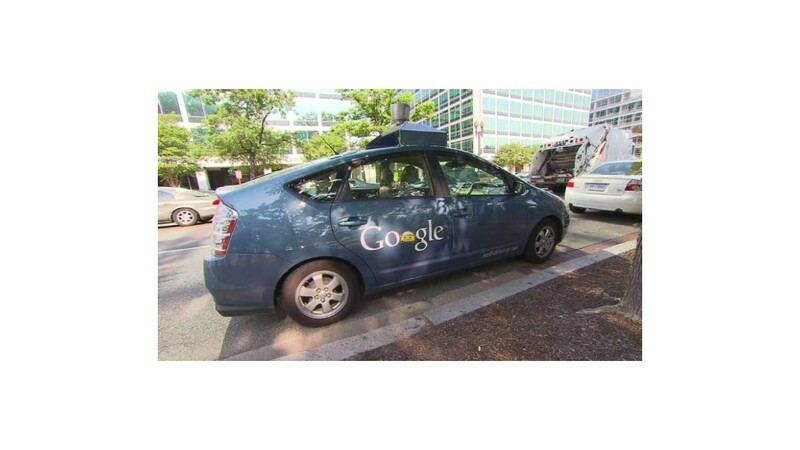 Famously Web search giant Google (GOOG) has been researching self-driving cars. Google's research car is based on a Toyota Prius, but Google and Toyota have not been involved in each other's research projects, according to a source at Toyota. Toyota also showed off a 2013 Lexus production car with advanced pre-crash safety systems at CES. A number of automakers, including Lexus, offer systems that can signal drivers, apply brakes and even close windows when sensors detect that a collision is imminent. Among the features of autonomously driven cars available in automobiles today, especially high-end luxury cars, is "active cruise control," which can automatically maintain a safe following distance behind cars. Some of these systems can even work in stop-and-go traffic, automatically applying the brakes and accelerator as needed. German automaker Audi, part of the Volkswagen Group, is also expected to make its own announcement regarding autonomously driven cars at the show. Audi was just granted the second permit to operate an an autonomous vehicle in the state of Nevada. The first was given to Google in May of last year. By eliminating human error, which causes the vast majority of car crashes, autonomous driving technology is seen as having the potential to greatly reduce traffic deaths on America's roadways. Toyota is not necessarily working toward a fully self-driving car, the automaker said in an announcement. "In our pursuit of developing more advanced automated technologies, we believe the driver must be fully engaged, said Mark Templin, general manger of Toyota's Lexus Division said in announcement.